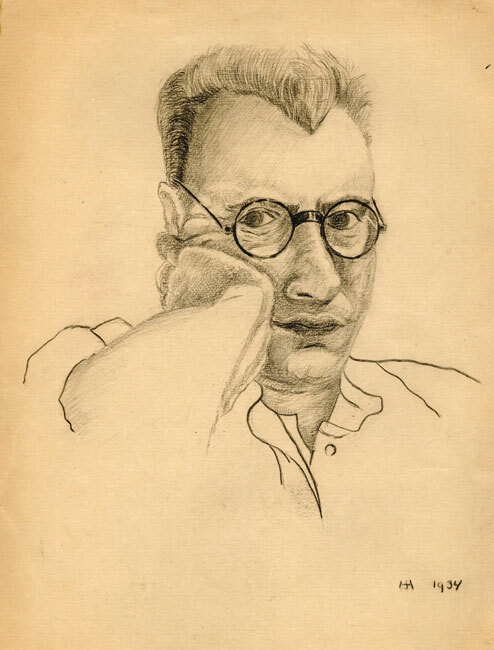 Samuel Horwitz was born on the 2nd of August 1907 in Amsterdam to Meir (b. Maastricht 1877) and Lina (née Vaas, b. Amsterdam 1881) Horwitz. Samuel had an elder brother Solomon (Shlomo), born on the 2nd of November 1904 and a younger sister Eva, born on the 8th of September 1909. 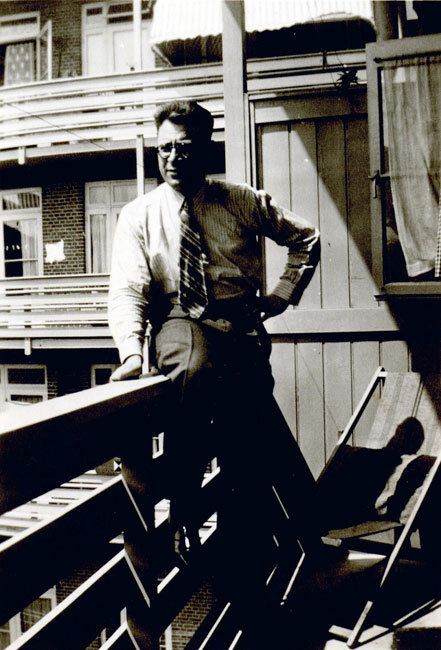 Horwitz started work at a young age as a bank clerk at Rijksverzekeringsbank (the Dutch national insurance bank). He studied for many years in order to advance his professional career at the bank and became an account manager. He was an amateur athlete and a member of the Amsterdam athletics club; he also enjoyed drawing and was friendly with professional artists. In 1934 Horwitz married a German woman, Maria Samann. Maria was born in 1905 to a Catholic family and from the age of 18 worked as a nanny in Amsterdam. Her parents did not object to her marriage to a Jew even though it took place a year following Hitler's rise to power. On the 21st of June 1938 their only son was born, Erwin-Paul. The family lived in Amsterdam at 102 II Vechtstraat. Following the conquest of Holland, in November 1940, Horwitz was dismissed from his position. He began working in the migration and financial departments of the Joodse Raad (the Dutch Judenrat). He was active in the underground and arranged hiding places for Jews. 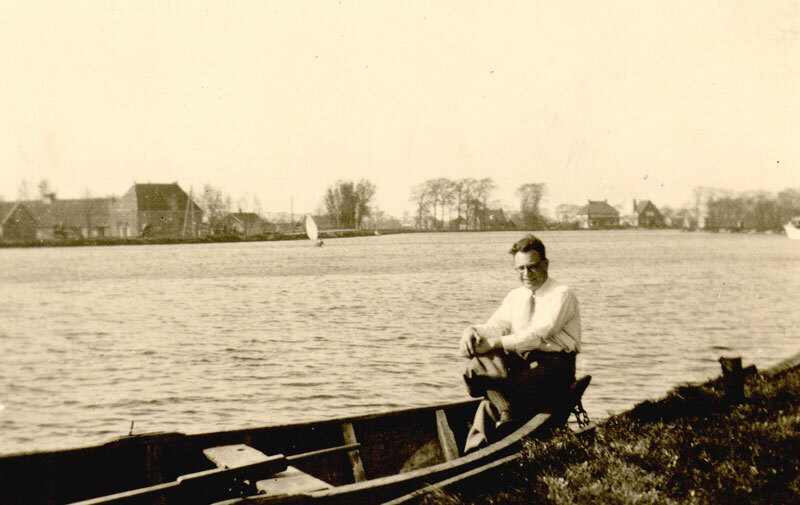 On the 28th of December 1943 Horwitz was imprisoned and held in a cell in the Amstelveensweg prison. On the 24th of March 1944 he was transferred to Westerbork transit camp, where he stayed in barrack no. 67, the criminals' barrack. 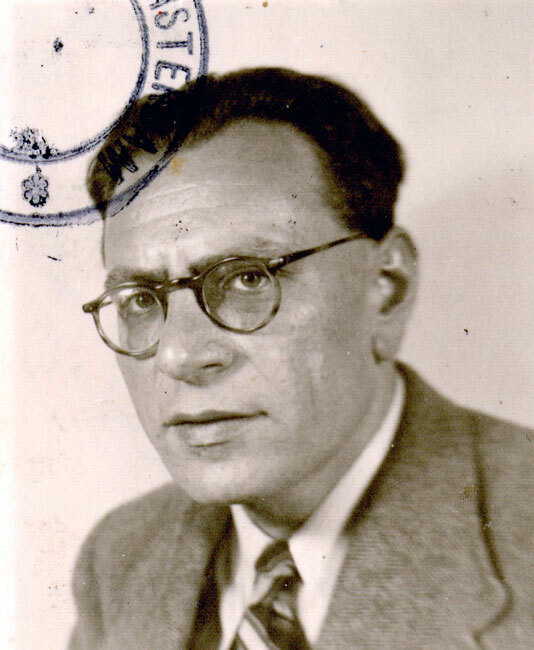 On the 5th of April he was deported to Auschwitz as a Strafgeval – a term used by the Nazis to refer to those who had been caught in hiding or had been active in the underground. Horwitz arrived in Auschwitz on the 7th of April, passed the selection, received the number 179919A and became an inmate of the camp. 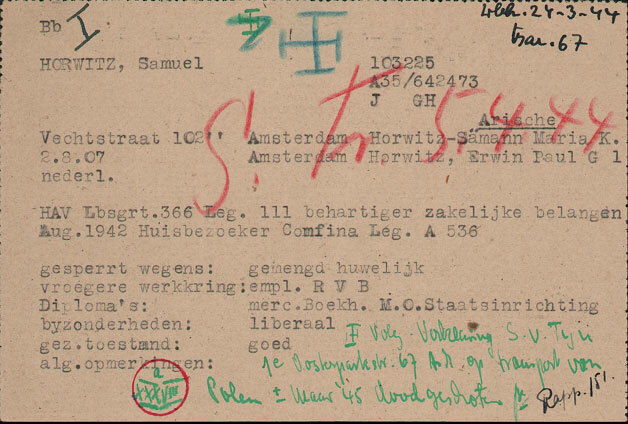 The last record of Horwitz in the camp documents is from the 6th of October 1944 in the Männerlager - men's camp. His wife Maria and their son Erwin-Paul survived. Maria died in 1972, Erwin-Paul lives in Holland. 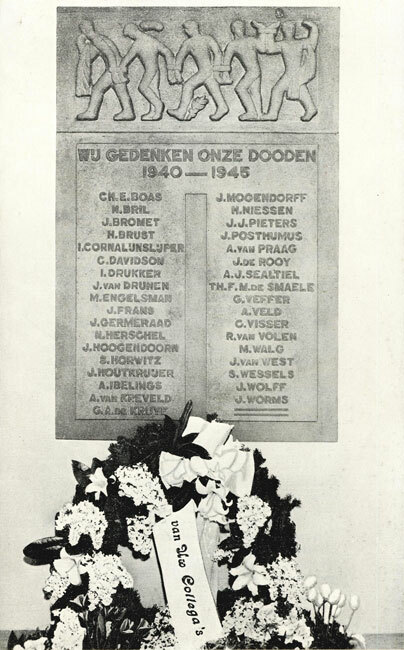 Horwitz is memorialized on the website of the Dutch Ministry of Defense as one who gave his life fighting in the underground during WWII. Samuel's parents, Meir and Lina Horwitz, were murdered in Sobibor on the 4th of June 1943. His brother Solomon married Klara and they had a son named Max (Meir). They were murdered in Auschwitz-Birkenau death camp; Klara on the 3rd of September 1943 and Solomon on the 31st of March 1944. Their son was hidden by the Dutch underground and lived under an assumed identity with a Dutch Catholic family in the south of Holland. In 1948 Meir immigrated to Israel and he lives in Beer Sheva. Samuel's sister, Eva, married Marcel and in May 1941 gave birth to their son Michel-Emil. The family was murdered in Auschwitz-Birkenau; Eva and Michel-Emil on the 23rd of July 1942 and Marcel on the 23rd of September 1942. On the 4th of April1943 240 Jews arrived at Auschwitz on an RSHA transport from Westerbork transit camp. The transport included 160 men, 112 women and 22 children. Following the selection, 62 men received the numbers 179648-179709 and 67 women received the numbers 76534-76600 and became inmates of the camp. The rest, 111 Jews, were murdered immediately in the gas chambers.